Pope Francis has departed from Rome and is headed toward Latin America. This morning, the papal flight, Boeing B777, carrying the Pope, his entourage and journalists, took off from Rome’s Fiumicino Airport. The Holy Father’s visit to Peru and Chile marks his 22nd international Apostolic Trip and his sixth journey to Latin America. As is customary, the Pope sent telegrams to the Heads of States of the countries he flew over. Also, before the flight, as is customary, the Holy Father went to Rome’s Basilica of Santa Maria Maggiore to entrust the trip to Our Lady’s help and protection. 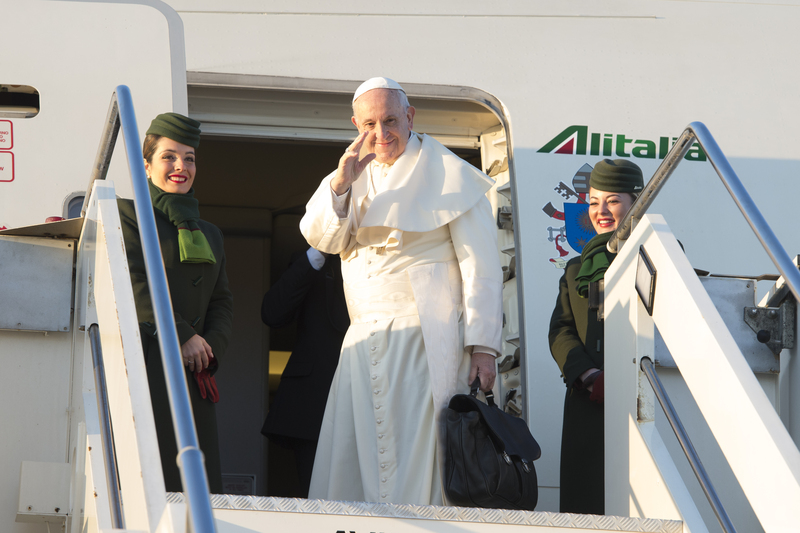 After the Pope’s nearly 16-hour flight lands, the Pope will be arriving in the country’s capital of Santiago after 8 p.m. local time and will go direct to the residence of the apostolic nuncio where he will be staying during his time in the country. Tomorrow will mark his first full day. He will celebrate a Mass in Santiago and visit a women’s prison. The day after he will go to Temuco, which has a large indigenous population. The day after, he will have an encounter with young people. The day before the Pontiff will leave for Peru, the Pontiff’s last day in Chile, he will visit the northern port city of Iqique. The visit will have great security measures in place, as in Chile the days ahead of the Pope’s arrival, there have been some protests.